Isn't this a pretty star sculpture/geometric object? Pretty, huh? At first I was afraid it would turn into a DIY fail as I couldn't get my super glue to set when I put the first four bulbs together (see below). But, with a little patience, heat from a blow dryer, baking soda, and hot glue...it finally came together quite easily. Now it's a pretty decoration for Christmas and all-year round. 1. Super glue the bases of 4 candelabra light bulbs together on a flat surface. (First I tried hot glue for this step, and it wouldn't hold this "foundation" of bulbs as sturdily as I wanted. Next I tried super glue, which wouldn't dry because of the metal used on the bulbs) So, after some "googling" of how to make super glue set....I put super glue on the bulb bases, pressed them together, sprinkled a little baking soda on the super glue which causes a chemical reaction that dries the glue almost immediately, and let that dry for a good while. This is the most intensive and the last Super Glue step thankfully! 2. Hot glue around the Super Glue at the central joint to make it even more sturdy. You won't see the center, so you really can't use too much hot glue. Let dry a few minutes. 3. Hot glue candelabra bulb on top, holding upright and perpendicular to the plane of 4 bulbs. Let dry a few minutes while holding in place. 4. Turn over and hold the bulb glued in the previous step, hot glue another candelabra bulb on top in the same exact fashion (upright and perpendicular). Let dry a few minutes while holding in place. You'll have a nice 6-point star after this step. 5. Hot glue a round bulb at the junction of each three-some of candelabra bulbs. 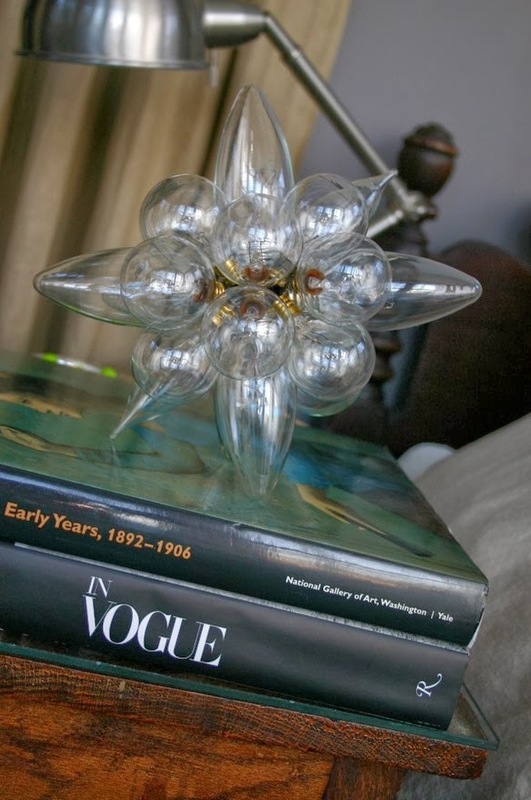 Wherever 3 candelabra bulbs meet, place a good dollop of hot glue and press a round bulb in. Let dry a few minutes while holding in place. 6. Rotate to the next junction of 3 candelabra bulbs and repeat until all junctions are filled with round bulbs - 8 total. What do you think of my little masterpiece? If you're wondering, total cost of bulbs was about $10. It's really a very artistic looking object - I'm no Chihuly, but it's a nice amateur glass sculpture if you ask me. Now how do I market this as modern art and make a million?